This November, we are excited to announce that we are hosting our third annual charity Gala: The 2018 Shine Through the Night Ball. 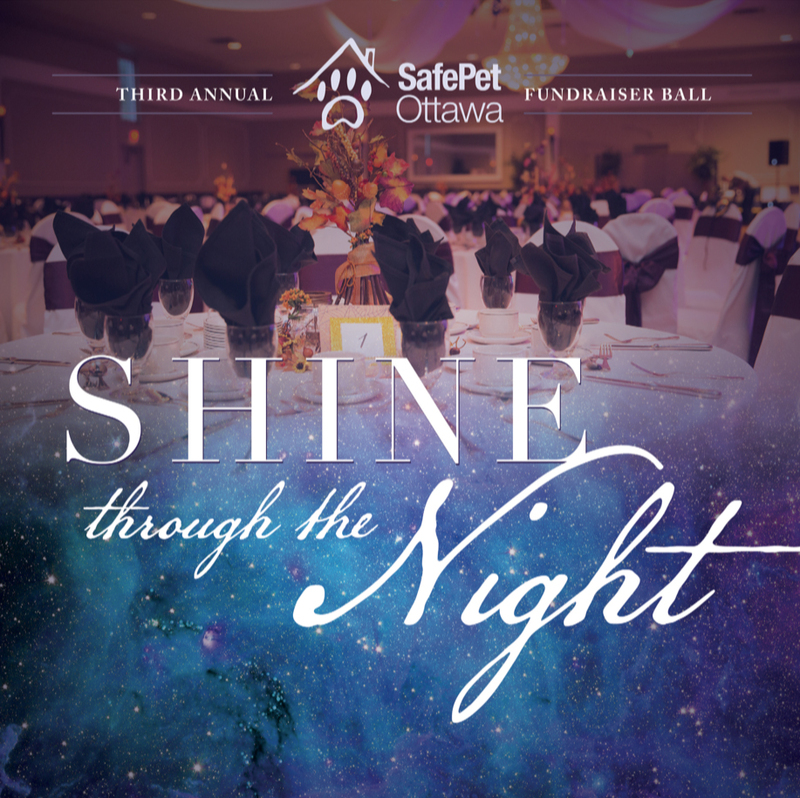 Our annual Ball is designed to raise funds dedicated to improving and maintaining the function of SafePet Ottawa as a charity organization. These funds will be directed towards: covering veterinary costs for injured or abused animals, to provide equipment, food and supplies to fosters with animals in their care and to continue to grow awareness in the local community of the SafePet Ottawa program. Join us this fall for another year of fabulous entertainment, stunning decor will be done by our friends at Sizzle With Decor, an outstanding silent auction and of course some delicious food (vegan and vegetarian options will be available)!! Everyone is invited! Invite your family, friends and coworkers (buy a table for your group at a discounted price) and be our guest alongside other elite business members of Ottawa and some surprise special guests. The attire is formal /black tie with an encouragement to adopt glitter, sparkles or silver into your wardrobe befitting our theme. This year’s Ball will take place on a Saturday, November 3, 2018 at the Ottawa Marriott Hotel (located at 100 Kent Street), chosen for its gleaming reputation, elegant décor, superb service, exquisite menu and central location for ideal accessibility by our attendees. The Night will begin at 6 p.m. and we will celebrate until 1 a.m. the following morning.